The next house I live in will have a bigger laundry room. I technically don't have a laundry room right now its a laundry closet. It's kind of a pain to wash clothes in there because its so small. Whoever built our house, put the dryer hook up on the left side and the washer hook up on the right, doesn't make a whole lotta sense to me, kind of backwards. Enough ranting, I decided to cheer up the space and make it a little more inviting so I painted it a light yellow color, pantone pale banana to be exact. Chris asked me why I would want to paint a room no one sees, my response "I see the room everyday". Yellow is a happy color, so I'm hoping it will cheer me up when I'm in there doing laundry. Everyone could use a little cheering up while doing laundry, right? It's kind of hard to photograph a closet with no natural light, but I did my best. If you've been in my house or seen pictures it was like most of the other rooms, beige walls and ceiling. I started by clearing the room of everything except the washer and dryer, then I primed the walls and ceiling. Next I painted the ceiling a standard basic white ceiling paint. Then I painted a few coats of Valspar Signature Pantone Pale Banana on the walls, in a satin finish. The pantone paint colors at Lowes require you to use the Valspar Signature paint that has the primer in it already, so I didn't really need to prime the walls first, but I picked the color after priming the room. Oh well. It took me a little longer to paint the room because I had to work around the washer and dryer and move them around as I was painting. It was a little tight, but it was kind of nice having them in the room because I was able to stand on them to paint, so I didn't need a ladder. I love how the room closet turned out. It definitely makes me smile when I go in there. I'm loving yellow right now! Here are a few other yellow projects I've worked on recently. Last year I painted Parker's dresser yellow and I love how it turned out. Yellow is Parker's favorite color. I recently painted this tray a bright yellow. 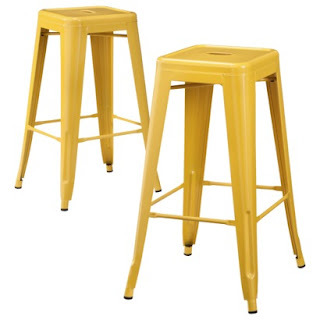 I bought this fun outdoor, yellow table and chairs from Target for our patio, this Summer. It brightens up our backyard a little. 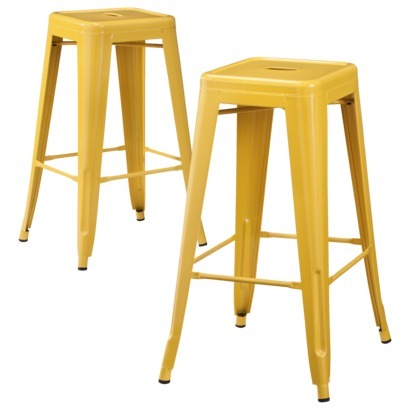 And I'm loving these yellow stools from Target. I wish they went with my kitchen.